I've been an expat wife since October.... but it was only last January when I really felt it. For some reason, when people learned that I don't work... they will ask me at least three times "why? , "when will you look for a job", " do you have a child to take care of?" and since we still don't have a child, the next question most likely is.... "why are you not working? ehhhh you don't have a child?" Expat wife. A woman who follows her husband abroad, often for his job, while her new job is caretaker and driver. She takes care of the kids, the home / showroom, herself (as in shopping, body treatments and tennis) and the social network (as in voluntary work, lunches and tennis). As a driver, she takes her kids to and from school, play dates and activities such as – tennis, usually in a fancy-schmancy car or a SUV. Errrr... No. That description is not mine. Yes, I did follow my husband abroad... well, not really. We arrived together here in SG. We still don't have kids. My husband and I take care of the flat. Yes, I do shopping but not the body treatments (because I still find it pricey) and I don't do sports. No, I don't drive. We have plans on getting a car but definitely not a fancy-schmancy car or SUV. Cars in SG are super pricey too! 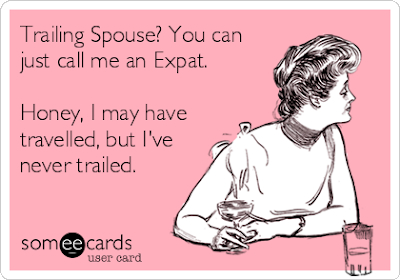 So, what's the possible signs of an Expat wife like me? 1. I miss the comfort of our own car. And still take the cab as my first choice. - back in PH, we're not rich. But Thank God for my parents that we're able to live comfortably because of them. We grew up with cars and a driver to bring us to school until my class schedule is close to my papa's schedule. I miss that I can buy groceries and bulky items and I don't have to worry if the items will fit in the cab. - during our first few months, we're in Ikea almost every week! our flat is fully furnished (and the owners have a good taste too!) but we still prefer to use some items that we personally purchased i.e. cutlery, bed sheets, bathroom rugs, cookware --- all from Ikea. First, the price! everything seems so cheap compared to Tangs. And you can easily mix and match the Swedish design. - because I want to try local brands, I google a lot while shopping! especially while doing the groceries. From cleaning brands to air purifier - i google for reviews while I stand in front of the item. - not because I'm lost. But because I'm following the arrow at my Singapore map apps. - that's my mantra whenever I go shopping for our flat. Is this item worth to ship to Manila when we move to another country or when we go home? or this item is ok to throw after 12-24 months of usage? -- and I go out wearing shorts, shawl when it gets cold in the train and I have a book or my phone to keep me entertain for the next 30 minutes or more. -- people are always rushing here, You'll see them running in walkalator and escalators especially during rush hours. Tourists will always approach me for directions and questions how to load or top-up their mrt card, I don't look like a local but then again maybe because I move in a slower pace, tourist might find it easier to approach me. - there's no rice and gravy in Mc Donald's and some KFC branches (i.e. singapore zoo branch). For someone like me who enjoyed drizzling her steaming white rice with gravy. This is major sepanx. Message to Moms from a non-mommy!